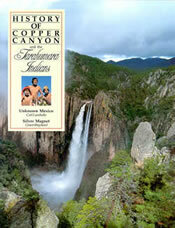 Sunracer Publications is pleased to announce the 2005 edition of the Copper Canyon Guide. This exciting new edition includes many new articles. NEW EDITION! OVER 100,000 SOLD! 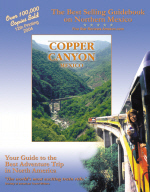 Announcing the new edition of the best-selling guidebook to Northern Mexico.The outstanding features of this guidebook include the unique and extensive coverage given to the Copper Canyon train, the legendary Tarahumara runners, plus new material on the prehistory of the area and the Paquimé culture. A new anthology, including the descriptions of Unknown Mexico by Carl Lumholtz and the Silver Magnet by Grant Shepherd. The outstanding photography of Carlos Lazcano of the Indian cliff dwellings near Madera, the publisher's photographs of the newly discovered crystal caves and the highest waterfalls in Mexico, together with features on Batopilas Canyon and its diverse cultures will bring the reader back in time to the experiences of Lumholtz and Shepherd. The publisher is pleased to present this new work detailing the outstanding history of the region. 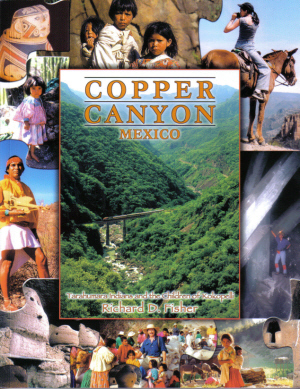 Two historical classics on the exciting and mysterious canyonlands of Mexico under one cover with two full-color sections by Richard D. Fisher, photographer and editor. The results of the 1997-2000 four extensive forays to Australia, following the trail of a mysterious NASA photograph and the story of finding world-class canyons on both east and west coasts on the Australian continent. 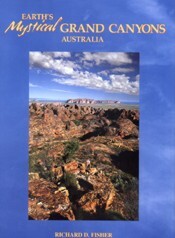 The outstanding features in this extraordinary book include the unique and extensive coverage given to the Blue Mountains near Sydney, which contain an estimated 400 gorges and slot canyons, the Bungle Bungle Range in northwest Australia and its striking landscape of sandstone "beehive domes", Karijini National Park in the Australian far west and the complex canyon system surrounding the crater site resulted from a sprawling impact crater from an ancient meteorite in the Middle Region. This book is in stock. Please send your check or money order now. - ON SALE NOW! - $9.95+ $3.05 S/H. The first publication to detail the recent exploration of the world's deepest gorge, the Yarlung Tsangpo of Tibet. In this, the ultimate book on canyoneering, the reader is drawn into unique and diverse environments, many of which have never been seen before in print. Traversing through the Grand Canyons of the United States, Tibet, Mexico, Bolivia, and China, this book begins as a guide, then transcends beyond into global environmental issues, ultimately illuminating the beauty of humanity in surreal wilderness canyons. Price: $24.95 + $3.05 S/H. - ON SALE NOW! - $19.95+ $3.05 S/H. Price: $9.95 + $3.05 S/H. - ON SALE NOW! - $4.95+ $3.05 S/H. The only book currently to detail all of the National Parks ofNorthern Mexico's border states Baja, Sonora, Chihuahua, Coahuila, Nuevo Leon, Tamaulipas. This is also the only book to cover the Sierra del Carmena cross the Rio Grande River from Big Bend National Park, Texas. Includesfeatures on the Islands in the Sea Of Cortez and the Seri Indians as well as Copper Canyon and the Tarahumara Indians. Full color with fantastic maps and excellent descriptive test. This is a one of a kind publication the only one on this subject. You will be very pleased with this beautifully illustrated and informative guidebook. Price: $16.95 + $3.05 S/H.